Very few exercises are as therapeutic and as relaxing as swimming. The activity invigorates your whole body, head to toe, leaving you completely relaxed and a few calories lighter. Unfortunately, Mother Nature has almost total control over the swimming season considering that in the winter, the temperatures can plummet to near freezing which would inevitably disrupt and effectively bring to an end the swimming season. However, with technological advancement in the modern age, you can now extend the swimming season for as long as you want, which would also render the term ‘season’ meaningless. Currently, the steady and increasing proliferation of high-quality, high-performance and relatively affordable pool heaters mean you can effortlessly and quickly heat your swimming pool, whether it’s a small ground pool or a large in-ground pool. Picking out a pool heater from a market filled to the brim with all sorts, sizes, and types of models can, however, be a daunting, time-consuming, and laborious endeavour, especially it’s your first. It’s not as easy as picking an apple in a grocery store. In your search, you want to pick out the absolute best, one that fits your heat requirements to a T. Also, because most pool heaters are a lifetime investment, ending up with the wrong one can be very costly. In light of these challenges, it is prudent that your selection is guided by a few factors, both to simplify the process and to guarantee that you get the most suitable one. Apart from your own unique requirements, other factors you’re going to have to take into consideration, in no particular order, are performance, convenience and ease of use, ease of installation, and construction quality. Over the course of its more than 8 decades of existence, Hayward has consistently demonstrated a knack for manufacturing some of the most cutting-edge, technologically advanced pool equipment. Such consistency continues to earn them an ever-growing and loyal customer base from all corners of the world. One of their flagship products, the Hayward H400FDN immediately springs to mind when the topic of best pool heaters comes up. Its performance is both reliable and unyielding, as you would expect from a high-end pool heater. In addition to letting you heat the pool or spa to a level you find most comfortable, the pool heater also omits the lowest levels of NOx, meaning that you'll be enjoying efficient luxury and peace of mind all year long. The exceptional off-the-charts performance is wholly attributable to the fact that it incorporates the most innovative and energy-efficient Finn plate exchanger constructed from high-quality cupro nickel and all of which are durable and robust Cupro Nickel. With this feature, the user will enjoy several years of smooth and trouble-free pool heating at an impressive thermal rating of 84 percent, which also translates to effortless and efficient heating in the shortest time possible. Not even salty, hard or high flowing water will be able to negate the performance of the pool and spa heater. The pool heater also overshadows several other pool heaters on the market with the innovative design of its polymer head, which inevitably results in greater hydraulic performance. The result in superior energy efficiency and greater protection against the destructive consequences of erosion resulting from fast flowing water. Furthermore, the design leads to significant improvement in reliability and by extension, the performance of the Hayward H400FDN. It doesn't stop there. The other awesome feature is the forced draft combustion system. Because of the system, air is constantly moving through the combustion chamber at a rate pre-set by the manufacturer. The design eliminates any and all weather-related conditions which, left to their own devices, would negatively impact the performance of it. The design consequently eliminates the need for installing high-wind stack that is most necessary with low-quality, off-brand models. As is the case with the vast majority of pool heaters, it is a cinch to use. It incorporates an intuitive and easy to use LED digital control panel that displays to the user the current temperature of the water any relevant diagnostics. The control panel provides for effortless and comfortable monitoring and controlling of the temperature levels just by using a quickly accessible button. The digital control is very accurate and therefore helps the user reduce the amount of time and money they would otherwise waste to get the pool to reach optimal operating temperature. Another feature that makes it an attractive option is the ease of installation. The machine perfectly blends universal-fit flexibility and advanced technology to make it easy to install. To this add a lightweight and compact design that coupled with the contemporary low-profile guarantees universal compatibility with all types of systems and equipment pad designs. It emits the least possible NOx and therefore complies with the strictest environment protection laws around the world, particularly the United States. And, in light of the manufacturer's use of high-quality materials, the Hayward H400FDN Universal H-Series 400,000 BTU Pool and Spa Heater will last for several years to come, providing you with hassle-free, smooth performance. The H400FDN produces remarkable 400,000 British Thermal Units for fast and optimal pool heating all year long. It is eco-friendly too, emitting the lowest levels of NOx during operation. Both the interior and exterior parts of the pool heater feature high-quality, rustproof construction to provide for durable and dependable operation. The installation process is also pretty easy and straightforward, thanks to the voltage conversion functions and gas valve flow settings. Clearly, the pool heater has an endless litany of ground-breaking features and specs, the most outstanding of which are the versatility of its design, incredibly easy installation, and affordability. You won't regret purchasing it. This heater may not be cost-effective, but you get what you pay for. For such exceptional performance, ease of use and durability, the price is totally fair and reasonable, especially if you really want to enjoy relaxing, toasty temperatures. Its powerful performance, efficiency, and reliability easily make it one of the best pool heaters on the market. It's an incredible deal when you also factor in the durability of its construction and the awesomeness of its features. Hayward just can't seem to stop churning out high-quality, high-performance, practical, and high functional pool heaters. Another one of their leading products on the market is the Hayward H150FDP Pool and Spa Heater. While it has striking similarities with its bigger brother, it nonetheless has distinguishing characteristics of its own. For instance, it boasts an impressively high 84 percent industry-leading thermal efficiency, which completely overshadows most other pool heaters out there. The pool heater is similarly compliant with all the environmental protection regulations set by such states as Texas and California. To this add the fact that the Hayward H150FDP, like most other pool heaters, emits the least possible amounts of NOx to the environmentally, making it one of the leading choices for environmentally-conscious users out there. It effectively brings to an end the days of holding your breath before dipping your toes into the pool. It keeps the pool warmer and toasty all through the year and in light of its energy efficiency, it does not burden you with huge fuel costs. The pool heater comes with a game-changing heating technology that coupled with its hydraulic performance, considerably cuts down the time it would take the pump to circulate. 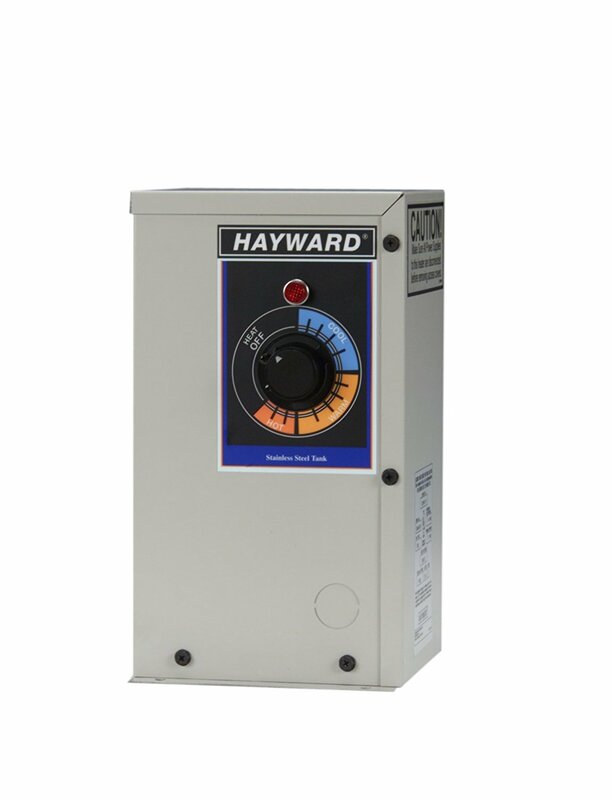 The Hayward H150FDP provides a quick and efficient water heating solution, taking up to an hour to effortlessly raise the temperature of an 800-gallon pool by 30 degrees. The performance of other cheaper, run-of-the-mill variants on the market pales in comparison to that of the model. The days of pacing impatiently by the side of the pool waiting for it to heat up effectively come to an end with the Hayward H150FDP. The ease and efficiency with which the pool heater raises the temperature of the water is yet another demonstration of its several decades of expertise and experience and commitment to the production of high-quality, high performance yet eco-friendly products. You might already be overwhelmed with the instrumental features of this option but we're only beginning to scratch the surface. It still packs a host of time-saving, convenience and performance features that aim to take the effort and time away from heating your pool, leaving you only with the best possible experience. Other outstanding performance features are the stainless steel burners, corrosion-resistant Finn Plate heat exchangers made from Cupro-nickel and the insulated Fire Tile combustion chambers. Lumped together, the features account for the incredible performance of this pool heater that you'll be relishing. Using it is just as easy as you would expect from a high-end pool heater. There is a user-friendly LED control panel that keeps an eye on the performance of the machine, making it more convenient and comfortable to run with very minimal involvement from the user. The ignition system of the pool heater guarantees lights dependably and operates reliably all throughout the year at the touch a simple button. Like the previous model, the Hayward H150FDP comes with a very functional forced draft system that provides for the consistent movement of air through the combustion chamber at a very precise rate with the aim of eliminating all unwanted weather variables that would otherwise affect the heating performance of the pool heater. The elimination of wind conditions, for instance, does not necessitate the installation of a high-wind stack. It would beat the purpose buying a high-performance and easy-to-use pool heater you can’t install in a new or existing swimming pool or spa, right? Luckily, Hayward has the necessary wherewithal to make their second flagship pool heater easy and quick to install. By combining advanced technology with universal-fit flexibility, you’ll spend very few minutes setting it up and getting it to run smoothly and efficiently, especially considering its compatibility with all types of equipment pads. The heating mixture of air and gas is capable of sustaining the user's swimming needs, adding to their comfort in light of its energy-efficiency and ability to minimize operational costs. Plus, it is an eco-friendly alternative with one of the lowest NOx emission rates in the industry. If you’re on the market searching for an energy-efficient, low NOx emitting and affordable pool heater, take a closer look at this option. The innovative design of the pool heater, with the padding of its Finn plate and incorporation of cupro-nickel tubes, provides for quick and efficient heating of your pool all year long. In addition to the efficiency of its distinct V-shaped heat exchangers and its user-friendly LED control panel, the pool heater is also reasonably lightweight and compact, weighing around 121 pounds and dimensions of 28 inches by 32 inches by 30 inches. For that reliable and efficient performance along with a host of advanced features, the Hayward H150FDP should be your go-to pool heater. Keeping your pool warm and toasty all through the day doesn’t have to take much effort and time. Neither does it have to dig a deep hole in your pocket, as some pool heaters would. If you’re scouring through the Internet in search of a functional and practical pool heater, let’s make it easy for you. 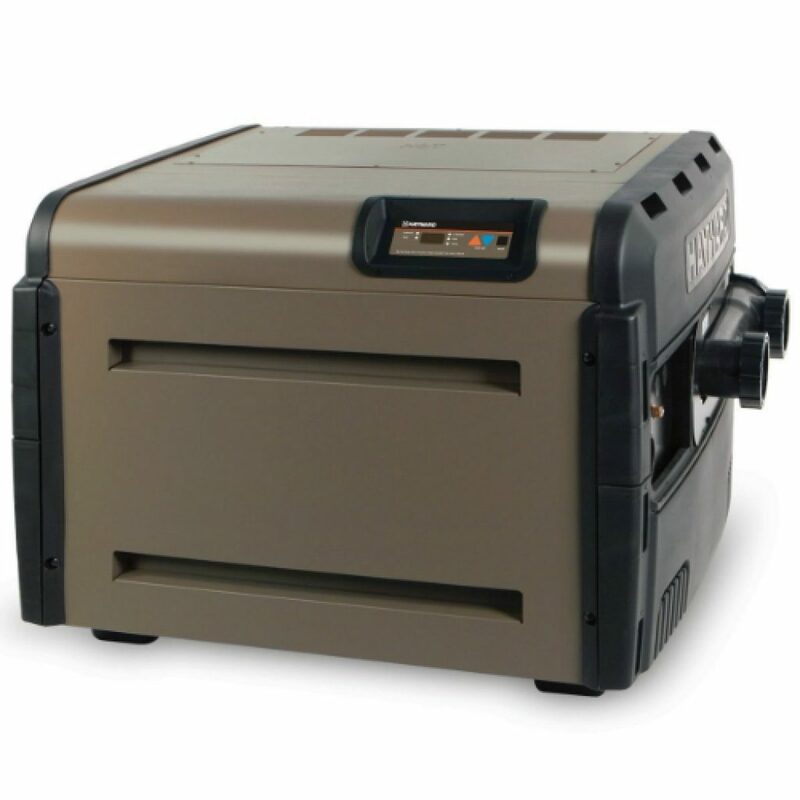 Ladies and gentle, allow us to introduce you to the Pentair MasterTemp Propane Pool Heater 460733. People have different criteria for performance and value. Luckily, this pool air is one of a handful that meets all of them. 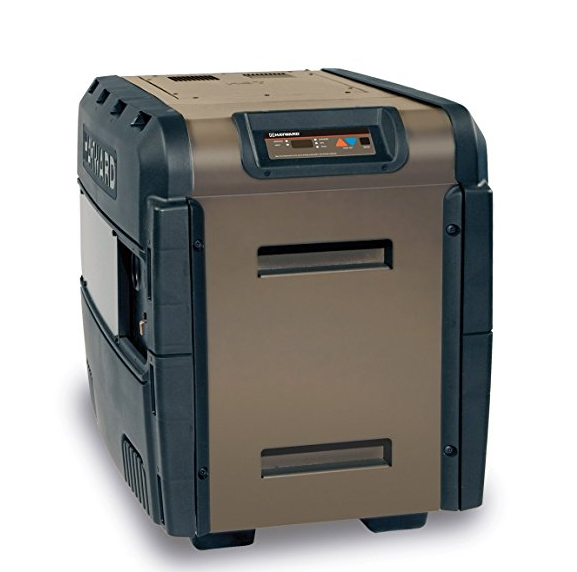 The pool heater effectively epitomizes efficiency, convenience, and reliability. It's an ideal choice for users who want trouble-free, smooth, and noiseless performance from a machine that's lightweight and compact and easy to use. An in-depth review of the Pentair 460733 follows in the subsequent paragraphs. 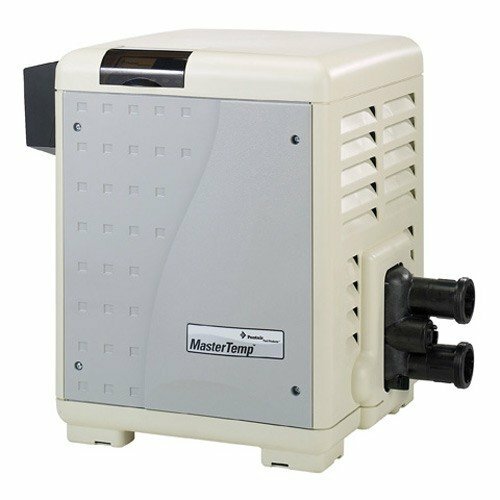 MasterTemp is an industry leader that continues to break new ground with game-changing innovations, and no product exemplifies this like the Pentair 460733 does. In spite of its high-performance and ease of use, the pool heater features a surprisingly compact design. With a weight of 120 pounds and dimensions of 36 inches by 30 inches by 25 inches, it is neither the heaviest nor the bulkiest pool heater you'll come across as you comb through the Internet. Consequently, you can confidently use small equipment pads during installation, and you can rest assured there is no chance they're going to intrude on the pool. Still, make a point of leaving adequate space to allow for easy manoeuvrability and servicing, when, not if, the need arises. Another solid reason to go with this option is that it's one of the most energy-efficient pool heaters at its price range on the market. The remarkable efficiency with which gas and air mixes in the system provides for a very quick heat up time. Unlike cheap, off-brand models flooding the market, you won't have to pace up and down or impatiently tap your feet on the ground waiting for the water to heat up to comfortable levels. It is one of the very few pool heaters that perfectly combine comfort and economy without prioritizing one over the other. Another unique selling point and one that makes it immensely popular with homeowners and commercial establishments is the ease of using it. Unlike other pool heaters, this model features the convenient and easy-to-use hot surface ignition without the pilot light. Couple that with the easy accessibility of the digital controls and you have yourself a machine you can use effortlessly without any hiccups or frustrations. It also has several indicator lights on the user interface that make it easy to operate and monitor, all around the clock. Additionally, it has a digital display with controls placed at the front and centre, and because it is rotating, the display is quite easy to view irrespective of the position in which the pool heater is installed on the equipment pad. In spite of its high-performance capabilities, and an ability to generate up to 250,000 British Thermal Units, the Pentair 460733 operates smoothly and quietly. So quiet is the pool heater that it will take a keen ear to notice it’s even running. The quiet design aims to prevent it from getting in the way of your having a good time. With regards to construction, it features a robust, industrial-grade composite exterior that’s rust-resistant and therefore capable of handling any excess heat. To these add the NOx certification and the fact that it easily meets and even exceeds industry expectations of performance and durability. The design and engineering also aim to keep the user safe and sound as they have a good time. The pool heater has a water pressure switch that conveniently detects when the pump is running to prevent the likelihood of overheating. Secondly, the pool heater incorporates a high limit switch whose function is switching off the heater in case the temperature of the water surpasses limits pre-set by the manufacturer. The design also allows you to manually shut-off the gas when service is due. Together, all these features will keep you safe throughout your stay in the pool. In all, if you want value for your money, insist on the high-performance, safe to use, and reliable Pentair 460733. It packs all the must-have features, it has enviable efficiency, it's easy to use, and most of all does not cost as much. Other features that make it stand out include the eco-friendly operation, certification for low NOx emissions, quiet operation, ease of use, and the outstanding 250,000 BTU to keep your pool toasty at all times. The Jandy JXI400N heater is deserving of the second runner position on the strength of its endless list of signature features. The unique selling points include but are not limited to the lightweight and compact design, high performance, usability, ease of installation and durability. Additionally, it is an eco-friendly unit that complies with the strict DOE energy efficiency requirements. As a result, its emissions of environmentally hazardous NOx are quite low, and its thermal efficiency stands at an impressive 83 percent. Other features that inform the exceptionally high preference for the Jandy JXI400N among professional and domestic pool owners alike are the installation flexibility and its user-friendly design. Plus, it's a relatively affordable and long-lasting pool heater that will provide you with several years of pain-free and trouble-free performance. Now, let's dive into a comprehensive review of the pool to deconstruct the features that make it stand out. The Jandy JXI400N is a versatile and flexible pool heater that installs quickly and with minimal effort in the vast majority of pools, spas, and combinations of the two. It's an eco-friendly alternative that uses only natural gas to produce an incredible 400,000 British Thermal Units. Even when temperatures drop below sub-zero, you’ll still be able to enjoy a relaxing swim in toasty waters all through the day. Like our first pick above, it boasts a thermal efficiency rating of 83 percent, which essentially makes it one of the most energy-efficient pool heaters out there. Couple energy efficiency with the fact that it produces low levels of NOx and effortlessly exceeds energy efficiency standards set by such agencies like the DOE, and you finally begin to understand why it is the darling of environmentally conscious users all around the world. If your mind is not made up yet, then the fact that the Jandy JXI400N provides users with exceptional performance, thanks to the venturi-driven air and gas mix, will sway your purchasing decision. It honestly doesn’t get better than this. The heater has an incredibly ultra-compact and lightweight design, with its footprint coming in at just 2 feet by 2 feet and corresponding weight of only 126 pounds. Because of the small and highly portable profile, transportation and manoeuvrability will never be an issue with the pool heater. It will require just a fraction of the instrument pad needed by heavier and bulkier models on the market. Similarly, the pool heater retrofits with a lot of ease with plumbing flexibility and therefore eliminates the need to adjust any plumbing. Also, since the top of capable of a 180-degree rotation, there will be no point rotating the headers. Couple that with the sidewall ventilation and you'll have to reason for seeking professional assistance in getting it up and running on your own, provided you’re a little technologically savvy. The digital interface provides for hassle-free and straightforward tweaking of the different control settings. To this add the machine’s compatibility with AquaLink and iAqualink that lets the user shift with ease and speed between the pool and spa modes. Additionally, the pool heater features a flip-up design that enables you to quickly and easily access the electrical panel. The also makes servicing the pool heater a stress-free endeavour. The stainless steel header bar and the temperature sensors are both corrosion-resistant, meaning that they'll provide you with a superior, durable and reliable performance for several years to come. In closing, allow us to reiterate that the Jandy JXI400N is an exceptionally lightweight, compact, eco-friendly, easy to use and high-performance pool heater that will ensure your water is comfortably toasty all year long. Transportation and manoeuvrability are a breeze with the pool heater, in light of its aforementioned small design. And so is the installation in tight and confined spaces in which its plumbing flexibility provides for effortless and quick installation. Properly heating a swimming pool, spa or hot tub requires a considerable amount of energy. And of the several pool heaters on the market, very few have what it takes to efficiently and quickly raise the temperature of a significant volume of water quite the way Hayward CSPAXI11 Spa Heater does. It is an ideal choice for homeowners with average-sized spas and hot tubs. The lightweight and compact design makes it an ideal choice for homeowners who need an easy to use, easy to install and of course, affordable pool heater. Considering the strategic placement of dials on the front of the pool heater, controlling the temperature of the water will be quite a cinch, and there is a user manual to guide the user through the installation process meticulously should they encounter any difficulties. In spite of its diminutive characteristics, the Hayward CSPAXI11 is not a slouch when it comes to performance. It comes with an assortment of features that have, until now, been the preserve of pricier, high-end models. The pool heater uses an innovative system that brings together electrical currents, a heating element, and water that together effortlessly raise the temperature of water by some 5 degrees-Fahrenheit every hour. While the performance is impressive, it nonetheless pales into insignificance when compared to that of gas-powered models with induced draft systems. Consequently, you will have to provide a heating window of between 4 and 6 hours for the Hayward CSPAXI11 to efficiently heat up the water to comfortable levels. The time approximation, of course, will also vary depending on the coldness or warmness of the water at the time of heating. The installation process is quite straightforward and quick and demands little effort on your part. Because it produces 11 kilowatts and 240 volts while pulling roughly 45 amps, you'll have to use of a 50 amp wire and 40 amp breaker, at the very minimal, to achieve an optimal operational level. Using cheaper alternatives is highly discouraged as it could hamper the performance of it or even worse, cause a fire after melting the insulation. 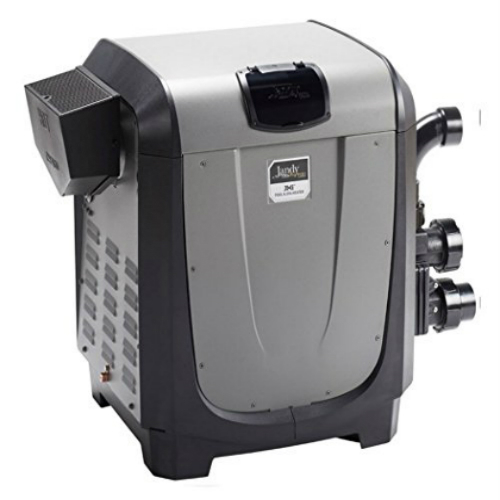 The beauty of the pool heater is that it provides the user with the full benefits of an electrical model: no frustrations dealing with gas lines or connections. As long as you have the breaker and that you get the wiring correct, you can actually get the system up and running all by yourself. Before we get to the ease of using it, let's look at its overall construction quality and the aspects that make it stand out. All the critical components of the spa or hot tub heater feature high-quality construction using industrial-grade and very durable 304 stainless steel. Some of the components made from this material include the tank, the heating element, and the threaded head. Stainless steel also comes with the added advantage of being resistant to corrosion. Consequently, the user is sure of several years of utmost performance, irrespective of the predominant weather conditions in their region. Apart from the sturdy, long-lasting construction quality, it also comes with a litany of other related features that make it easy to use. For instance, it sports a convenient and life-saving safety sensor that will immediately alert the user if something is out of order. The other is the service-ease design that, coupled with its lightweight and small design takes the effort and time away from the exercise when it is due. With all its high-end features, one would understandingly expect the Hayward CSPAXI11 to be pricey. Surprisingly, though, it is quite affordable. The high heating capacity allows it to easily and quickly raise the temperature of water in most spas and hot tubs. It is capable of efficiently handling anything with water volumes of between 1000 and 2500 gallons. As long as the size does not exceed 2500 gallons, the pool heater will provide for even and efficient heating all year long, and with minimal to no performance issues at all. Overall, the Hayward CSPAXI11 works exactly as advertisements depict: seamlessly and efficiently in spite of its lightweight and small physical dimensions. Bright together the awesomeness of its construction and the efficiency of its performance and you have yourself a tool you'll be using for the next several years confidently and with peace of mind. To these add the ease of installation, ease of use, and the unbeatable price. If you want reliability, value for money and efficient operation, choose the Hayward CSPAXI11 heater. The list of best pool heaters would not be complete without bringing up the efficient, sleek and modern looking Hayward HeatPro 110K BTU. It comes with a laundry list of features and capabilities that deservingly earn it a spot on the list. For instance, the pool heater features high-quality construction using industrial-grade and corrosion resistant materials. It is therefore capable of withstanding the rigors of heating a large volume of water in coastal and salty water regions without the slightest impact on its performance. Consequently, the heat pump will definitely provide you with several years of trouble-free performance in addition to keeping the environment safe. The Hayward HeatPro is an ideal choice for use in in-ground pools in which case it operates quietly and smoothly. The vast majority of pool heaters are rendered not operational when the temperatures drop below 50 degrees Fahrenheit. However, you can get it in a low ambient option which works just as efficiently and as smoothly when the temperatures drop to 40 degrees Fahrenheit. Keep in mind that the performance efficiency of the pool heater also drops the further the temperatures drop, meaning that it might not operate optimally if you install it in generally cooler areas. In the right conditions, the performance is more than exemplary. It is one of a handful of lightweight and compact pool heater capable of outputting about 110,000 British Thermal Units. The machine also boasts an incredibly high-efficiency rating: it needs a fraction of the resources that its full-size counterparts need to operate optimally. Consequently, at the end of the month or year, it won't dent your pocket as much as other gas-powered models would. The construction will provide the user with several years of trouble-free, efficient performance irrespective of the hardness or softness of water in their locations. The robust outer shell prevents against corrosion and rust that would otherwise occur from having the pool heater is watery conditions most of the time. As is the case with virtually all Hayward pool heaters, the Hayward HeatPro comes with a user-friendly LED digital display. Through the screen, the user has quick and easy access to all the settings that allow them to tweak or customize the pool heater to their preferences. Things like monitoring and controlling the temperature of the water and of course starting and stopping the heater can be done quickly and in a hassle-free manner from the very accessible panel. You can even run the diagnostics to find out if the Hayward HeatPro is running optimally. While heat pumps like the Hayward HeatPro have a high acquisition cost, operating them is quite a cinch. They are less demanding and the ease of servicing them allows you to stay on top of things all through its useful life. The high-quality construction also means they won't be hanging up their boots any time soon, provided you use them in strict adherence to the manufacturer’s recommendations. Warming up your pool in the winter does not have to be a time-consuming and frustrating affair, as this heater clearly demonstrates. Featuring a commercial-grade all-titanium construction that’s impervious to corrosion and rust, it is the perfect choice to use in your pool. It works quietly and with minimal distractions. If you need a dependable, high-quality and affordable pool heater that is also easy to use and install, don’t look any further than this option. Clearly, the Hayward HP50TA HeatPro Titanium 50,000 BTU Heat Pump can’t hold a candle to pricier high-end pool heaters on the market seeing it is only capable of 50,000 British Thermal Units against an industry average of between 150,000 and 250,000 British Thermal Units. However, going by the rave reviews it receives on Amazon.com and its current performance rating, you would be doing yourself a great injustice dismissing it outright on the basis of its performance. The pool heater easily increases the temperature of a 15,000-gallon swimming pool to some 85 degrees in just a couple of days, with an incredible energy efficiency rating of 84 percent. Additional features that make it outstanding are the ease of installation, the lightweight, and compact size, the durable construction of the heat exchangers from high-grade titanium and its quiet operation. The exorbitant price tag aside, the pool heater clearly has more to offer. Let's find out. It continues to garner rave reviews on Amazon.com and other leading seller websites on the strength of its performance, ease of use and durability. It also works great with above ground swimming pools. In dissecting its performance, we'll begin with its heating capabilities. The pool heater, for one, is compatible with pools containing up to 13,000 gallons of water and will raise the temperature of the water mass over a couple of days to somewhere around 80 degrees. The days of gnashing your teeth when plugging into a swimming pool in full expectation of frigidly cold water are long done. Moving forward it’ll be just warm, comfortable and toasty waters. The construction out of high-quality and durable materials is yet another one of its several unique selling points. All the crucial parts prone to damage by different weather conditions, particularly the heat pump, are made from materials that are highly resistant to corrosion. Whether it is and constant exposure to water of the pool chemicals, the professional construction aims, and invariably succeeds, at keeping rust and corrosion at bay. The manufacturer extends the same construction quality to the ‘Ultra Gold’ evaporator coil. Consequently, salt and chemicals will not be threatening to the performance or durability of the Hayward HP50TA for the next several years, irrespective of the softness or hardness of water where you live. Aside from the high-quality construction, it also comes with the most robust and sturdy body panels. The panels as both injection molded and UV-resistant. That gives it a competitive advantage over cheap, off-brand models on the market, allowing it to withstand all the damaging consequences elements the weather can throw at it. In addition to being entirely solid, the pool heater has a formidable injection molded polypropylene body that resistant to both rust and corrosion. UV resistance also means there isn't even the remotest possibility of it discolouring in the soaring heat of the summer. Plus, it is also aesthetically appealing. The last but equally important features are the lightweight and compact design and the ease of installation. It has physical dimensions of 31 inches by 40 inches by 35 inches and corresponding weight of just 120 pounds. It won't take much space but will require some on all sides, so it operates optimally. The installation process is an easy and straightforward DIY. However, the necessary extensive wiring, it’s best to seek professional assistance to ensure everything runs smoothly and without any hiccups. To summarize, it is an ideal choice for above ground swimming pools. It packs all the requisite bells and whistles to make for effortless, stress-free and efficient heating of water. It offers the user real value for their money. Running it is cheap, and it is very easy to use. Couple the durable titanium construction with the 24-month warranty for repair or replacement of defective or malfunctioning parts and components. And when life gets hectic, and all you want is the soothing, relaxing and comforting warmth of the water, the Hayward HP50TA will always rise to the occasion, providing you with an impressively near grave-quiet operation. You have the acoustic compressor cover, the swept-wing fan blade, and the brand's patented soundproofing to thank for the quietness of its operation. You can have a normal conversation, make a phone call or even fall asleep by the poolside without the pool heater sporadically interrupting you. The closest you're ever going to get to hear the pool heater doing its thing is when you stand over the heat pump changing the temperature settings. Like most other pool heaters, the Hayward HP50TA comes with a user-friendly digital LED control panel to ensure practicality and ease of use. Through the panel, you can easily and quickly change the temperature to a level you find most conducive depending on the time and prevailing weather conditions. Additionally, the panel helps you keep track of the temperature level and to run diagnostics to help identify areas that need servicing and even guide you through the servicing process. The display is large enough so you can clearly see the readout from a distance. Also, since the heat exchangers are constructed from titanium, they offer more reliable, efficient and effortless performance in comparison to those of metals. The Smartpool S601P SunHeater is the first solar power pool heater to make the list. And for a good reason. Obviously, it is very cost-effective as it uses neither electricity nor gas and in the same breathe very eco-friendly, releasing no traces of NOx into the atmosphere. There might be a temptation among users looking for powerful pool heater to dismiss this model. Surprisingly, even though it’s solar-powered, its performance closely rivals those of gas-powered models and in some cases, exceeds them by far. 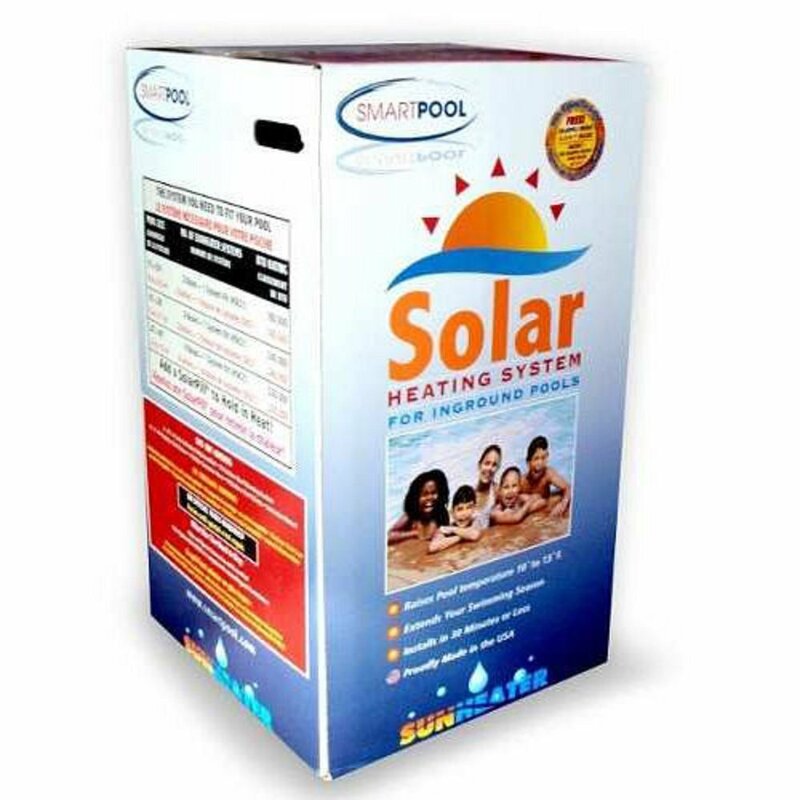 Other than using solar, the Smartpool S601P comes with most of the standard features typical of pool heaters. The machine passes water through specially-designed panels that collect the concentrated power of the sun and uses it to heat the water relatively quickly and with nearly the same efficiency as electric and gas-powered models. It comes with a panel array measuring 4 feet by 20 feet. The design allows the user the discretion of adding as many panel arrays as they see fit, provided the number is commensurate with the size of the pool. For the pool heater to operate optimally, the user has to install the system on top of the roof to ensure maximum exposure to the sun. As for the installation process, the user has the option of going at it all by themselves or seeking professional assistance. While the preference is yours, the second option will considerably dent your pockets. If, on the other hand, you decide to go at it yourself you'll also have to incur the additional cost of purchasing an installation kit, couplings, and fittings among other things separately. Irrespective of the installation route you decide to go with, the Smartpool S601P will provide you with incredible value and will work efficiently if the climate in your place of residence is warm and sunny. As mentioned earlier, the performance of the pool heater is not as efficient as that of electric or gas-powered models. Nonetheless, it will effectively raise the temperature of your swimming pool by at least 10 degrees, thereby letting you enjoy a warm, toasty and comfortable swim irrespective of time of day. The machine runs quietly and smoothly and does not cost a lot of money to run. It is eco-friendly and will considerably extend your swimming season, allowing you to lengthen it considerably. 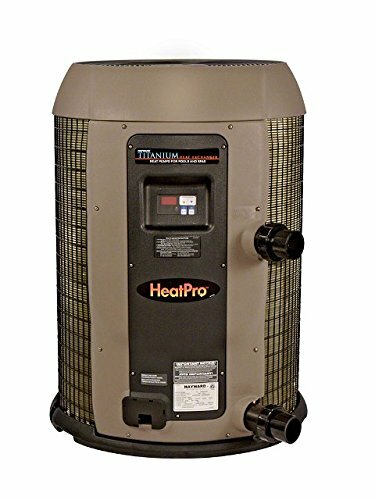 The Pentair 460736 Eco-Friendly heater has a reputation among pool owners the world over for its affordability, fast and efficient performance, safety, durability, and ease of use. It easily and effortlessly generates up to 400,000 British Thermal Units, more than enough to keep your warm and toasty as you savour your relaxation and self-therapy. Since it uses natural gas, it is much cheaper to run and maintain, and it runs smoothly and efficiently with minimal noise. When you're inundated by the availability of different choices, give some serious consideration to the Pentair 460736 for the richness of its features and capabilities. One of the first things you’ll notice about it is the ruggedness and robust construction of its exterior. Unlike cheap, off-brand pool heaters on the market, the model reeks of high-quality, top-end construction using durable and equally rugged industrial-grade copper-nickel. As a result, the pool heater easily stands up to rigorous everyday use in some of the largest pools around the world. Among other things, the material is resistant to the damaging consequences of salt build-up, rust, and corrosion. The result is a long-lasting, strong, rust and corrosion-resistant and resilient for the next several years. Couple that with the generously long 36-month warranty. 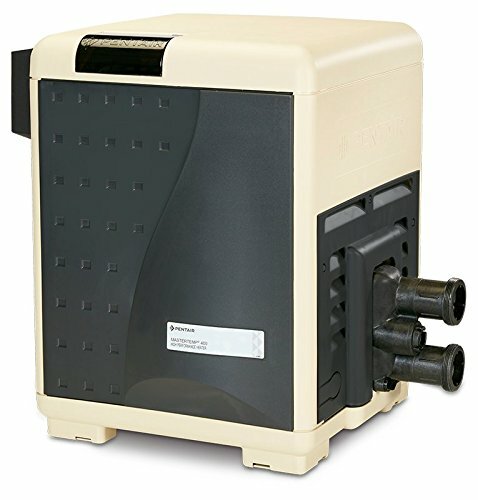 Within this period, the user will have immense peace of mind and confidence while using the Pentair 460736 with the assurance that should anything be defective or malfunction, either resulting from the manufacturer’s use of low-quality materials or poor workmanship will be replaced or repaired. Aside from the high-quality construction, it is also easy to use all around the clock and does not require that you have any previous experience operating pool heaters. Because of the gentle learning curve, using the pool is a cinch, and it comes with all these features and specs that take the effort and time away from the endeavour. For instance, it comes with a user-friendly rotating digital display that guarantees you don't experience any hiccups while monitoring the temperature of the water. The digital LED display is sufficiently large and features large digits that are easy to see and read from a distance. And while it is a powerful, gas-powered model, it effectively raises the temperature of the swimming pool within a short period of time and with very minimal noise. It won’t interrupt your phone calls or get in the way of your having a good time in or by the side of the pool. Through the control panel, the user can effortlessly monitor the temperature of the pool, diagnose any performance issues that need correcting, and even check scheduled service date. As is the case with the vast majority of pool heaters, the installation process demands little from the user, in terms of effort and time. The first thing you'll have to keep in mind is the physical attributes of the machine: the height, length, width, and weight. To this end, the pool heater has dimensions of 29.9 inches by 36.1 inches by 22.8 inches and a paltry weight of 120 pounds. Take these dimensions into consideration and compare them to your equipment pad and the availability of space for installation, manoeuvrability, and servicing. Maintaining the right water chemistry is crucial to preserving and prolonging the life of the key components like the heater, the pump, and filter. If you find the installation process to be intimidating and involving, it would be prudent to seek the services of a professional installer, just to ensure everything works smoothly and as advertised. Additional features that stand but which we can’t discuss in detail due to space constraints are the eco-friendly low NOx emissions, manual gas shut-off, the pre-mixed system, easy and quick hot surface ignition, and water pressure switch for keeping you safe by preventing the machine from overheating. 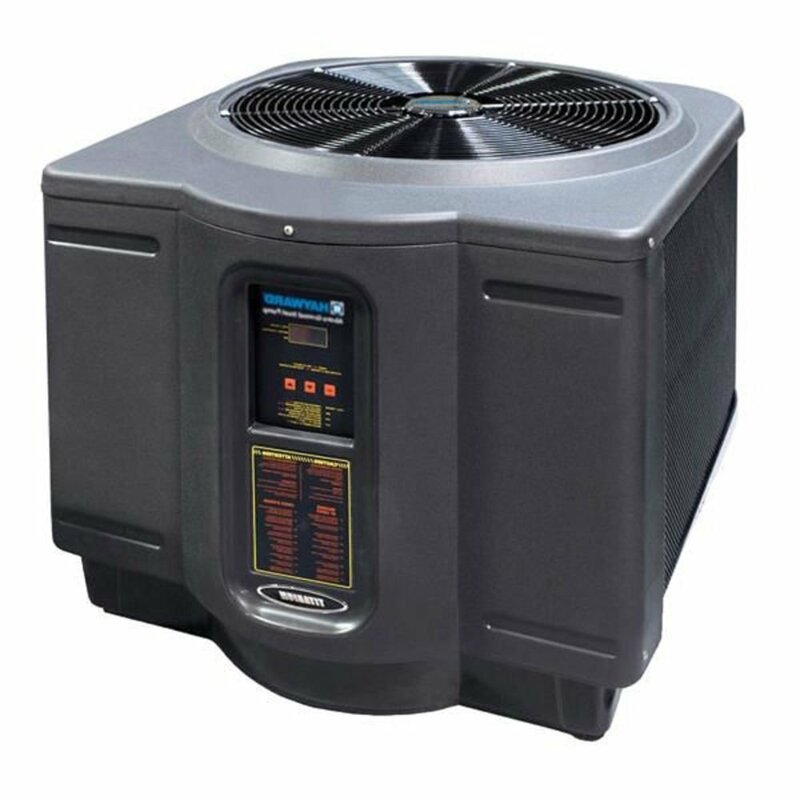 To summarize, the Pentair 460736 heater is an efficient and fast working pool heater loaded to the brim with a multitude of safety, reliability, and performance features. The tough and rugged exterior construction pairs nicely with its ease of use. It is energy-efficient, the installation process is a snap, and the icing on the cake has got to be the pocket-friendly price tag. It’s by far one of the best deals on the market. That’s undeniable. Our tenth pick is from the customer-trusted and highly-reputed Smartpool brand. It is a versatile, affordable, easy to use, eco-friendly and durable alternative to the expensive gas-powered and electric models out there. 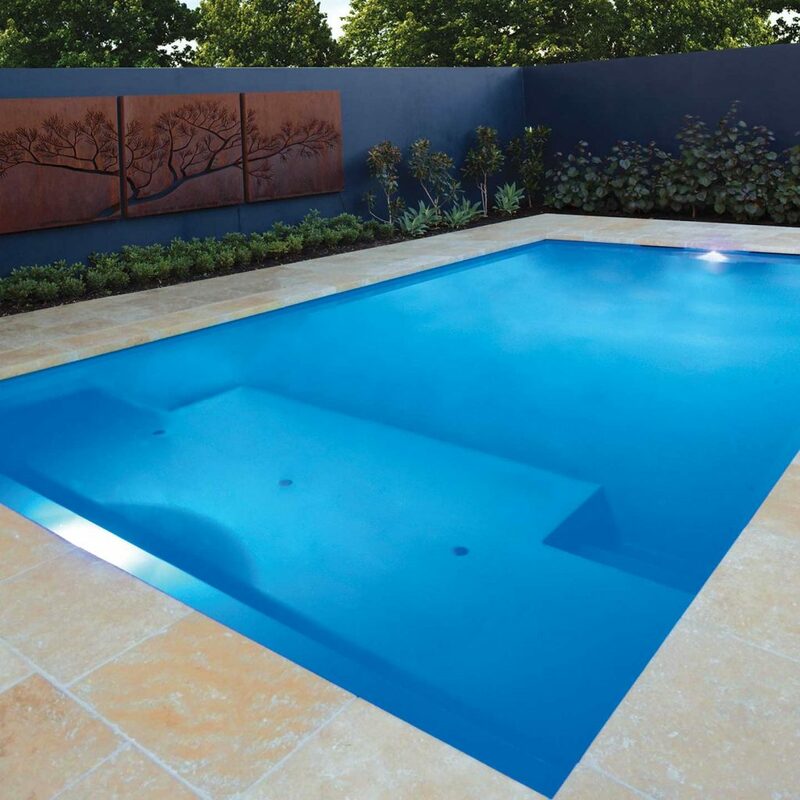 It is similarly very versatile as it is compatible with both ground and above ground pools. Every nook and cranny of the Smartpool S601P SunHeater for In-Ground Pool reeks high-quality construction, and there are a plethora of safety and convenience features to ensure the user has peace of mind while using the pool heater. For an in-depth review of the machine, continue reading this brief, and we know you're already hooked because other than mentioned features and specs, the pool heater is also a cinch to run and maintain. Obviously, like all other solar heaters, the Smartpool S601P works by harnessing the power of the sun to raise the temperature of the water and as such, comes with several solar panels to maximize exposure to the sun. To this end, the machine uses some 80 square feet of solar panels to guarantee the optimal conversion of the rays into solar energy. While it will eventually heat up your pool, it nonetheless lacks the speed and efficiency of its electric and gas-powered models. Consequently, it can take up to a couple of hours for the temperature of water to increase to noticeable levels. Keep in mind though that the ability of the S601P to raise the temperature of the water is dependent on several factors, the most important being the sunlight availability. Since the sun’s availability or rather the degree to which it shines it not within your control, you can still get the most out of it by installing the panels in a way that ensures maximum exposure. Another advantage is the exceptional quality of its construction. The use of industrial-grade materials for the construction means it boasts incredible durability and can easily and effortlessly stand up to the rigorous task of heating large volumes of water every day, all year long, and for several years. Like the vast majority of its gas-powered and electric counterparts, the pool heater is also capable of withstanding salty waters, rust, and corrosion. With proper care and on-time maintenance, it should provide the user with several years of smooth, efficient, trouble-free operation. The design and engineering aim to give the user the easiest time operating and controlling the machine. To this end, the pool heater has an easy-to-use control panel for tweaking the various settings, monitor and even control the temperature levels. The installation process is just as straightforward and simple. In fact, it is much simpler compared to the time-consuming, complex nature of electric and gas-powered variants on the market. Installation is as simple as rolling it out and fitting it on the instrument pad. If you're lacking in upper body strength, you can look for an extra pair of hands, but the Smartpool S601P Sis both lightweight and compact. So the process should actually be a breeze. A few users indicate that while the installation process is easy and straightforward, the low-quality valves, ties, and tools considerably make it complex. A simple remedy would be to use your own installation kit. And if find it hard to follow the installation procedures, it would be prudent to also look for a professional to ensure everything works smoothly. Just to reiterate, the S601P is a budget-friendly, easy to use, durable, and very versatile heating solution for your swimming pool. The installation process is a breeze. There is very little maintenance the user has to do. Whether you have a ground or above ground pool, it will fit snugly and properly, thereby guaranteeing you several years of warm, toasty water. If you’re environmentally conscious and want to preserve the Planet, don’t hesitate to go with this option. Pool heater with a higher BTU (British thermal unit) rating, will effectively and quickly raise the pool temperature in a fraction of the time it takes those with a lower rating. Consequently, the user should take into consideration the size of their pool before committing their money. While high-performance pool heaters are patently more expensive, they’ll spare the user the frustration of waiting endlessly for the temperature of the pool to rise to comfortable and accommodating levels before dipping in. Of course, a higher BTU rating also translates to more energy consumption but it’s a worthy trade-off if you really want to extend the swimming season. While we’re on the performance, keep in mind that gas-powered models are more efficient and fast in heating water, followed by electric models and lastly solar pool heaters. On a similar note, it’s important that you familiarize yourself with the type of pool you have. Is it above ground or in-ground pool? The two have different water holding capacities and hence come with heating requirements. Closely related to the performance factor discussed above is the physical attributes of the pool. Large pools obviously carry a lot more water than their smaller counterparts. To effectively heat a large pool holding lots of water, you’re going to need a powerful heater packing lots of BTUs. The aim is to cut the time and effort it takes to reach the desired temperature. There are sorts of pool heaters on the market suitable for large, medium and small-sized pools. Take this into consideration before buying to avoid wasting your money on an overperforming or underperforming unit. It beats the point buying an expensive pool heater with a cluttered control panel, if at all it has one, that’s difficult to use. A pool heater needs to take the time, effort, and frustration away from warming the pool; it should be as easy to use as possible. To this end, pay attention to the convenience features it packs. Is the control panel within easy reach? Is it cluttered with several confusing buttons or not? The design of the pool heater should provide the user with an easy way of changing the temperature settings and viewing the temperature readouts. Similarly, it should be able to operate quietly to not interfere with the peaceful and quiet pool environment. While they are considerably more powerful, gas-powered are notorious for producing a lot more noise than their electric and solar-powered counterparts. The constant exposure of pool heaters to water increases their susceptibility to rust and corrosion, especially if you install them in salty waters. To guide against corrosion and rust affecting the delicate internal components like the heater, the pump, and filter, ensure your unit is high-quality construction using durable and rust and corrosion-resistant materials, so they provide you with several years of trouble-free and smooth heating experience. On another note, the installation process is usually a smooth and straightforward one, at least for the vast majority of pool heaters. To make it simpler, manufacturers endeavour to make lightweight and compact designs that are compatible with most equipment pads. During installation, make a point of leaving sufficient room for manoeuvrability and services, if and when it is due. For electrical models, the installation can be a little complex, and it might be difficult, especially for greenhorns, to get all the corrections right. To ensure the machine works efficiently and smoothly, it is advised that you have the brand do the installation or that you seek professional assistance. Q: Do pool heaters produce a lot of noise? A: Unless one quantifies, in terms of decibels, the noise a pool heater produces, it’s difficult gauging how noisy they are. As a general rule, though, gas-powered models are considerably noisier than their electric and solar-powered models. It all comes down to the number of moving parts the machine packs. Models with components like fans, blowers, and fans motors will generate more noise than those that don’t. Q: Is a pool heater a DIY installation? A: Currently, manufacturers endeavour to make pool heaters featuring simple and modest design without compromising performance to increase ease of installation. For seasoned users, there is a high likelihood they can pull it off by themselves. Greenhorns, on the other hand, might be inundated by the complexity of some heaters. If you’re not technologically savvy or the instructions manual is vague or ambiguous, it would be prudent to hire a professional. A pool heater is an efficient way of circumventing the restrictions Mother Nature imposes on the relaxing and therapeutic activity that’s swimming. They allow the user to considerably extend the swimming season and enjoy the toasty waters all through the year. The objective of this guide has been to impart to you the requisite knowledge to enable you to make an informed decision. And to that end, we put together a list of ten of the best heaters on the market, thus sparing you the trouble, time and effort of scouring helplessly and desperately through the vastness of the Internet in search of a suitable pool heating solution. They are all affordable, very long-lasting, high-performance, and easy to use. We hope you find the most suitable one.